Daniel Vallero, PhD, is Adjunct Associate Professor in the Department of Civil and Environmental Engineering, Pratt School of Engineering, Duke University, where he leads the Engineering Ethics Program and teaches courses in green engineering and professional ethics. He has also conducted research related to environmental exposures and risk in human populations and ecosystems and has advised policy-makers around the world on a variety of human health risks and ecological issues. Chris Brasier, AIA, LEED AP, is a Principal with SmithGroup, an architectural, engineering and planning practice. He is also a Lecturer in the Department of Civil and Environmental Engineering at Duke University where he is Director of the Architectural Engineering Certificate Program and co-teachesa course with Dr. Vallero in green engineering. CHAPTER 1. THE EVOLUTION OF DESIGN PROCESS. Process: Linear and Cyclical Design. The Necessity for Synthesis-Integrated Innovation in Sustainable Design. Models from Nature of Integrated Systems Design. Emerging Tools for Collaboration, Synthesis, and Innovation in Design. Applications of Physics in Green Engineering. Systematic Design and the Status Quo. Ad Hoc and Post Hoc Life-Cycle Perspectives. Intervention at the Source of Contamination. Intervention at the Point of Release. Intervention as a Contaminant Is Transported in the Environment. Intervention to Control the Exposure. Intervention at the Point of Response. Applying Thermal Processes for Treatment. Biology Is the Green Engineer’s Friend. CHAPTER 4. PLACE AND TIME. Thermodynamics of Time and Space. Soil: The Foundation of Sustainable Sites. Green Architecture and the Sense of Place. Pruitt Igoe: Lessons from the Land Ethic in 21st-Century Design. CHAPTER 5. SUSTAINABLE DESIGN AND SOCIAL RESPONSIBILITY. Revisiting the Harm Principle: Managing Risks. Justice: The Key to Sustainable Design. CHAPTER 6. THE SUSTAINABILITY IMPERATIVE. Green Practice and the Case for Sustainable Design. Social Responsibility: The Ethical and Social Dimensions of Sustainable Design. Environmental Impact Statements and the Complaint Paradigm. The Role of the Design Professions. Green Design: Both Integrated and Specialized. CHAPTER 7. THE CARBON QUANDARY: ESSENTIAL AND DETRIMENTAL. The Good, the Bad, and the Misunderstood. CHAPTER 8. WE HAVE MET THE FUTURE AND IT IS GREEN. From Sustainable to Regenerative Design. Mass Production to Mass Customization. Studio I: Survey of the Literature. Studio II: Application of Sustainability Principles and Concepts. Low-Tech Design Based on Outside-the-Box Thinking. Seeing the Future through Green-Colored Glasses. 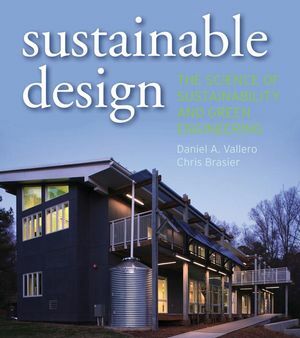 Vallero and architect Brasier, who coteach a course in green engineering at Duke University, wrote this book to assist architects and engineers in understanding the scientific principles underlying sustainable design. As such, this is not a catalog of green products and how they work, but a course in the basics of thermodynamics, the science of pollution, and professional ethics. The authors begin by outlining a "synthovation/regenerative model" of design to replace the stepwise model of the past. Rather than compartmentalizing the expertise of the various professionals involved in the design process and fitting them into successive steps, the synthovation/regenerative model combines synthesis and innovation with a team-based approach that makes use of individuals' expertise throughout the design process. This model is a recurring theme in the chapters that describe the need for an approach to sustainable design that is based on sound science and goes beyond greenwashing. The science chapters may be too much for some readers and not enough for others. Nevertheless, this is a good introduction to the science behind green design. Recommended for architecture and engineering libraries. 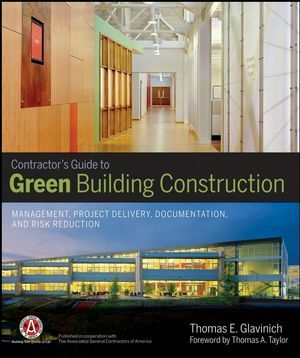 Introduces case studies of actual green projects the authors have worked on in their positions as an architect and engineer. Student exercises will help develop awareness of issues, and encourage students to think outside the box in tackling design problems. Illustrated with practical case studies from the author's own work.